Stainless steel tanks remain an important capital expenditure of cellars. Although planned maintenance can lengthen the lifespan of cellar equipment considerably, the capital expenditure planning of cellars still remains one of the most important financial management aspects of wine cellars. Even if maintenance can postpone capital expenditure, it will be unwise if equipment or new technology is not replaced or purchased gradually over time. Because of the limited lifetime of wooden barrels, they must be replaced continuously, if certain wine styles are to be maintained. Most cellar equipment is also imported and fluctuation in the exchange rate can complicate the capital planning even more. About halve of the cellars plan to increase their capital expenditure during 2018. The primary aim of 2018 capital expenditure by almost two-thirds of the respondents was to increase their capacity. It is especially in the case of small cellars, while larger cellars rather replace equipment or purchase new technology. Seventy-plus percent of the cellars will increase their tank capacity. The trend exists to increase the purchase of all equipment to the highest level in three years, except for the purchase of bottling equipment. 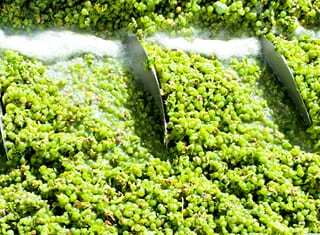 Most cellars indicated that bunch or berry sorting will be applied prior to or after destalking. Seventy-eight percent of the cellars plan to purchase tanks during 2018, which corresponds with previous years when tank purchases was the most important capital expenditure. Pumps, filters, bottling equipment, sorting tables, destalkers and presses follow in that sequence. Interesting priority differences do, however, exist between different size cellars. Although tank purchasing remains the most important consideration for all cellars, the small cellars lend more priority to sorting and destalking equipment, while medium size cellars attend more to presses, filters, bottling equipment and especially pumps. This is expected, because the latter cellars should attend to their pump inventory continuously. 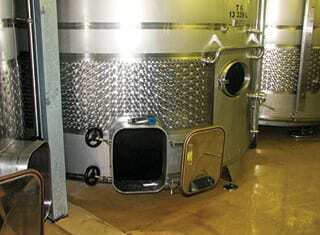 Wine tanks can be made from different materials, but 304- and 316-grades stainless steel are the most generally used. The 316-grade contains 2 to 3% molybdenum, less chromium, and more nickel than the 304-grade. The molybdenum increases the resistance against acid corrosion. The price of both grades is directly linked to the price of the manufacturing materials. Although the nickel percentage is only 8 to 14% of the alloy costs of stainless steel, it contributes 70% to the total material cost. Fluctuation of the nickel price thus has a direct impact on the price of stainless steel. The sorting of grapes or berries prior to or after destalking increased over the recent years. It is also true for larger cellars and grapes used for cheaper wines. 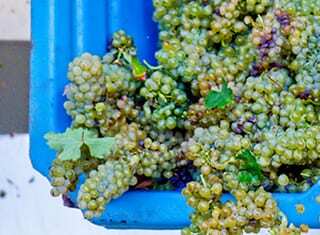 The size of the cellar does not play a significant role in the sorting procedure and it is rather the price point of the final wine, that determines the sorting procedure. Although automatic sorting equipment has increased, manual sorting is still applied the most. 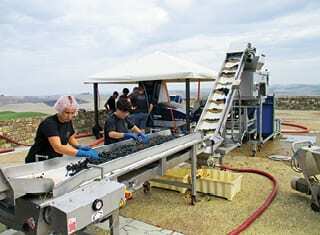 Optical, as well as non-optical sorting equipment are used by cellars. Considerable differences exist between different cellars regarding the stage of skin pressing. 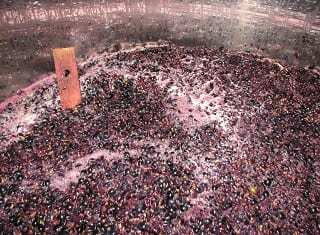 Although taste and fermentation stage are the most important factors at all cellars, taste is the dominant factor at larger cellars, while most smaller cellars press their skins after the completion of alcoholic fermentation (Philips, 2018). 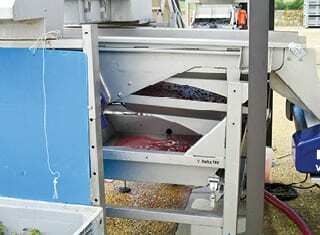 Bunch or berry sorting equipment increase in popularity. Philips, C., 2018. 2018 Winery Equipment Survey Report: Tanks likely most common winery purchase in 2018. Wine Business Monthly, March 2018: 23 – 32.